I've finished stitching on cupcakeguru's Halloween towel. I used this pattern of a Trick-or Treater out of a huge iron-on transfer book I found at a flea market last year. I just added the words on the bag. Here's the towel so far with only one more person to stitch on it. the colors really tie in with the whole towel! Here's a cute, shy cowgirl kitty for Pearlipie! 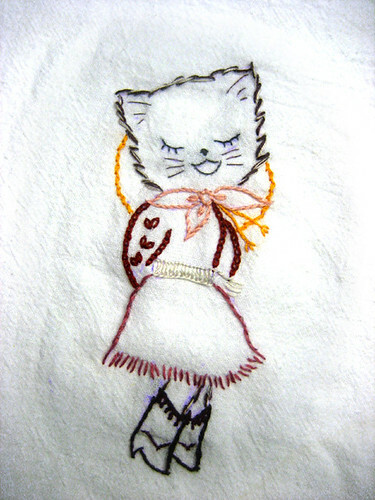 She loves cats and I thought she might like a kitty on her wild west themed towel! Her towel is so awesome! I can't wait for you to see it all! Rita- That's the cutest kitten I've seen in a very long time. I can't wait to see the whole thing. Eeeeeek!! I'm in love with that cowgirl kitty!!! I love that monster, FiberArtsy! I want a Halloween towel now, too! Rita, your kitten is perfect. I love her little demure pose. I also cannot wait to see Pearliepie's entire towel. fiberartsy - that image made me giggle. I love it and think her towel is looking good. ritapizza - cute kitty. I really like her skirt. My towel has made it's way home!!! Am photographing it now! I'm so in love with all the work you guys did on it! Eep! That kitten is SO CUTE! And your monster has been making me smile all day, FiberArtsy. Love it all! I've been so swamped that I haven't had a chance to take a picture of my completed towel. I will try to do it tomorrow.